The Statler's first fledge of 2010 is a female! 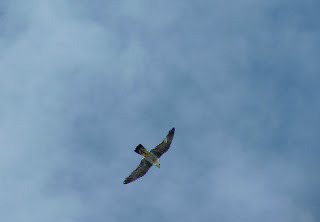 She landed in the street on June 14, was rescued, got a clean bill of health, was banded and named "Statler" as she may be the last banded Peregrine from this site. The DEC is denied access to the Statler building by the Bankruptcy Court, even for banding or rescues. Please, new fledges, fly free and safely! Lunch delivery of Brown Thrasher. Note the four hungry birds waiting! This feeding was half an hour before "Statler" was released from the top of City Hall, so, no wonder she wanted to leave! It was hot, smelly and crowded in the nestbox! In the circle is Jackie releasing "Statler" to freedom! Peregrine parent flying to her immediately!